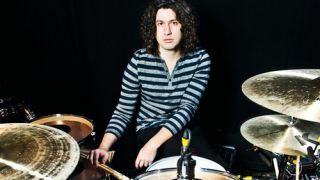 Drummer for Paramore, Angels & Airwaves and Nine Inch Nails, musical mastermind behind the one-man outfit, The New Regime, and recent Rhythm cover star Ilan Rubin has premiered a new music video for 'Daydream'. 'Daydream' is the first official music video to be released off Exhibit A, The New Regime's third studio project and first release in Rubin's "Exhibits" series, which was released worldwide on 7 May 2013. You can purchase Exhibit A on iTunes here. On the music video for 'Daydream', Rubin says, "The lyrics to 'Daydream' describe a place where nothing seems real and life doesn't seem to move forward. Without trying to put literal images to these lyrics, we wanted to find a real place that looked unlike anything else." He continues, "We went to the Salton Sea and surrounding areas which looked like they had been abandoned ages ago and had a fun and filthy time shooting over two days. The result, the 'Daydream' video." Exhibit A is an exploration of dynamics. Its eight songs are a mix of organic sounds and electronics. "'Daydream' is a song that displays a lot of stylistic themes found on 'Exhibit A,' says Rubin, "It started in its most simplistic form on an acoustic guitar with a lead vocal, but I wanted to transform it into an organic sounding, electronic hybrid." He continues, "Lyrically a lot of the songs on 'Exhibit A' are meant to paint a picture for the listener rather than tell a story and I think that comes across well in 'Daydream.'"